InLoox PM 7 uses its own division structure which is independent of the Outlook one. 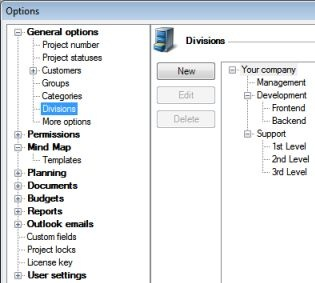 This structure is available only in the InLoox PM Enterprise Edition and is selectable in the projects. The divisions can be structured to any level and can be assigned to a specific project. How to edit the division structure in InLoox PM 7 • Copyright 1999-2019 © InLoox, Inc. All rights reserved.